Fresh from the farm produce is amazing. On yet another fruit picking outing, Mom and I picked Honey Crisp apples, blackberries, and peaches. We also picked up a whole bunch of vegetables while were on the farm. This salad is a great way of showcasing your farm (or farmer’s market) fresh produce. The dressing is flavorful but not overpowering. Preheat oven to 400°F. Drizzle chopped potatoes with olive oil, salt and pepper. Roast for 25 to 30 minutes, until golden. 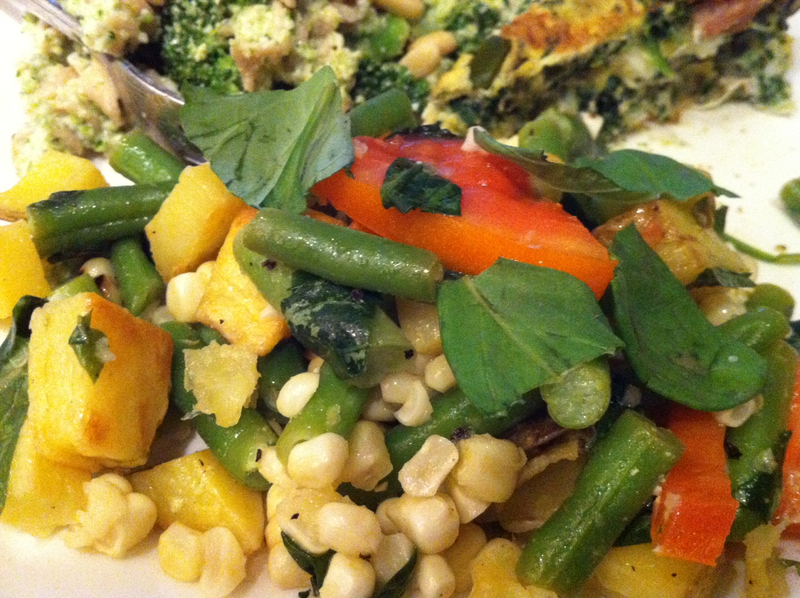 In a large bowl, combine roasted potatoes, blanched green beans, grilled corn kernels, basil and capers. Pour half of the dressing on the salad, taste and adjust seasoning and/or add more dressing. Serve warm or at room temperature.